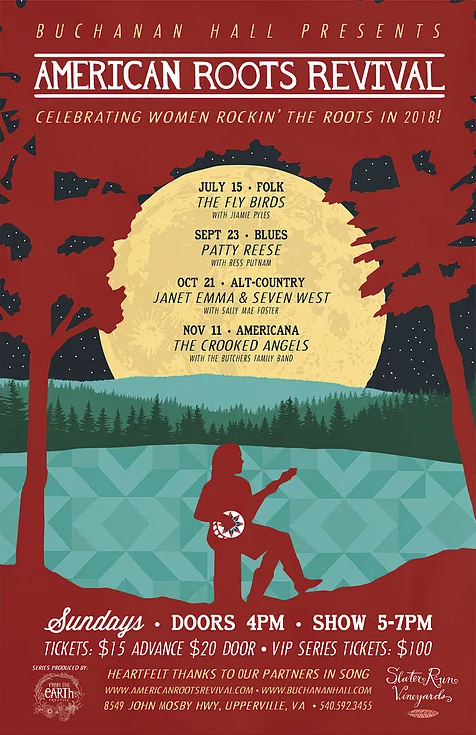 American Roots Revival brings to life the pioneering genres of our American musical traditions by showcasing current original roots music songwriters and performers. From Appalachian folk and country, to the blues and gospel, to Jazz, the American Roots Revival celebrates the diverse musical landscape that birthed a uniquely American sound. All shows begin promptly at 5 p.m. Doors open at 4 p.m. for general admission. Please arrive early. There is limited seating, mostly standing room. Shows end at 7 p.m. Doors close at 8 p.m. There will be a cash bar with beer, wine and non-alcoholic beverages, as well as a food truck. Includes admission to all four shows, plus an ARR swag bag, priority seating, and admission to a special season kick-off party on July 15! For more info about the party, click here.